Last year I was privileged to visit an old running mate in Texas. Tom Hart was a great Detroit Firefighter and was retired with injuries incurred on the job. He moved to a town called, Cut-N-Shoot, Texas. He quickly became involved with the local fire department. We keep in touch and I would like to share a letter I just received from Tom. It gives a snap shot of how a department that focuses on delivering emergency service to taxpayers should be run. I thought you might like to know what is going on here in Cut-N-Shoot Texas with our fire department. 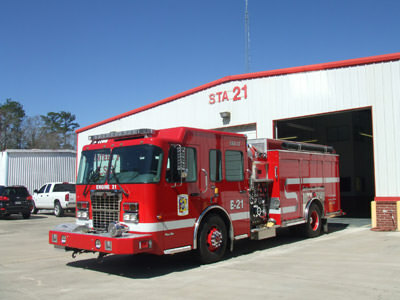 We cover 55 square miles, have 2 fire fighters on duty (24/7) and still have red fire trucks. the blue fire trucks are in a fire department north of us. I still serve on the Emergency Services District Board of Directors-ESD # 12 as the VP. We are in the process of updating our other station. It houses a pumper and a booster truck. it will expand to include a living area, dorm, and kitchen, taking the size from a 40 x 40 to 40 x 80. We will be looking to put in for a “Safer Grant” for hiring as we want to man that station with 2 personnel as well. We do all this on an annual budget just exceeding $500,000 per year. Currently we have 2 pumpers, 1 tanker and 3 boosters (the pumpers are reserve pumpers carrying a full compliment of rescue tools). All our personnel are fully certified fire fighters and paramedics before hire. 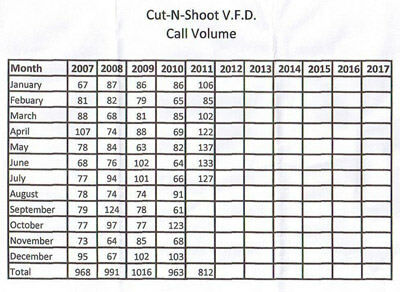 I have enclosed the July 2011 run report and annual call volume comparison this year vs. previous years. A lot of work for a crew of five. 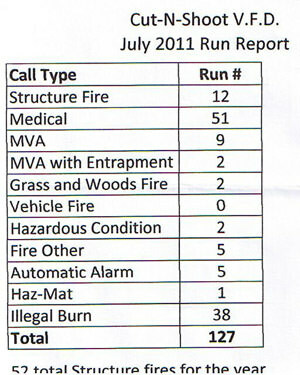 Of course we have automatic directed mutual aid with all departments throughout the county. The closest engine (a blue one) comes complete with a crew of 3. 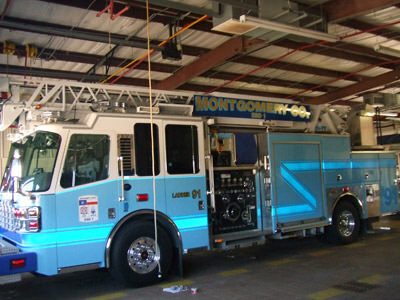 A first alarm compliment might consist of 2 engines and a tanker truck with about 7 to 9 personnel ( we don’t always have hydrants, our engine carries 1000 gallons of water and our tanker carries 1899 gallons. 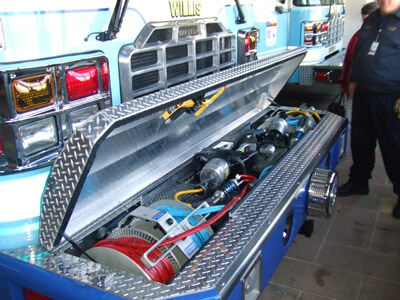 Our tanker can perform just like an engine-its not just for carrying water. Anyway I thought you might like to see the stats. All is well here, except it is a little hot. Of the four plus million acres burned in the country this year, 3.2 million were in Texas with a loss of 3 fire fighters. Texas has declared 234 of its 245 counties as disaster areas because of the heat and the fires. We have only had 3 inches of rain here since last December. I ran with Tony “O” at Engine 5s quarters. Everybody loved him. What a perfect example of a good man. I will tell you a funny story about Tony “O” sometime. It was so good to hear from Tom and his lovely wife Jackie. 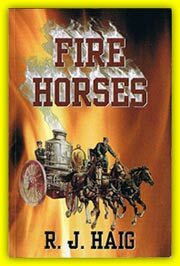 They are involved and effective in providing high quality fire service in their community. They were my gracious hosts as I bummed around the country last year. 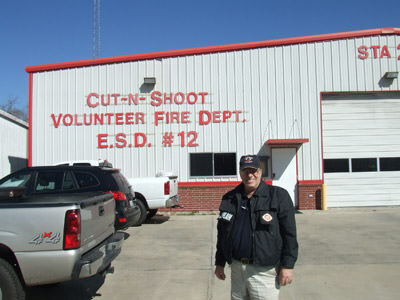 They run an impressive fire department in Cut-N-Shoot Texas. Thanks for the letter Tom. Hopefully you can be an inspiration for others and thank you for your service in the Detroit Fire Department. I know you miss it as I do.